The Shuswap, British Columbia – The Regional District of North Okanagan and the Columbia Shuswap Regional District have successfully concluded the purchase of the the CP Rail Corridor between Sicamous and Armstrong. Working in partnership, Splatsin and the regional municipal governments - along with 1/3rd Provincial funding support announced earlier in the spring by MLA Greg Kyllo and former Minister of Transport, Todd Stone - were able to successfully issue a recent news release announcing the corridor has been purchased and will be "used for recreational opportunities, including walking and cycling, while retaining it for future transportation and economic development needs. There is also long-term potential to connect this corridor to the Okanagan Rail Trail, which is currently under development, connecting the City of Kelowna to the District of Coldstream." There have been inquiries on how to contribute funding toward Rail-Trail development, which will be unrolled formally over the next few months - but early contributions to the Sicamous-to-Armstrong Rail-Trail have already been coming in. To respond, the STA has a Rail-Trail Reserve Fund in place to hold early contributions ready to transfer over, and is able to issue charitable tax receipts. As well, the STA will continue to act as a liaison point with community leadership and organizations. We have been privileged to grow relationships with the Armstrong-Spallumcheen Trails Society and Vernon's Ribbons-of-Green thanks to the Rail-Trail initiative, as well as the North Okanagan Historical Society. We hope to host a joint support meeting shortly, and would welcome hearing from interested organizations that have not yet been in touch. The STA has also been working behind the scenes to build relationships with inter-regional partners toward linking the Sicamous-to-Armstrong Rail-Trail initiative with the Central Okanagan Rail Trail and the Southern Trails-to-the-Okanagans initiative. The Thompson Okanagan Tourism Association has also taken a proactive role in supporting this effort. We look forward to growing these relationships in 2018. In the meantime, the Shuswap Trail Alliance encourages everyone to congratulate the Splatsin, CSRD, RDNO, Enderby, Armstrong, Spallumcheen, Sicamous, and Salmon Arm leadership and staff - as well as gratitude to our tireless Provincial leadership support - for modelling respectful inter-government collaboration at its very best in the interest of more accountable, healthier, active, and economically resilient communities. Did you know, CSRD and RDNO contributions also include support from the communities of Golden and area, Revelstoke and area, Lumby and area, and Coldsteam and area? Be sure to let them know you support their remarkable collaborative efforts in this important work of acquiring, building, and maintaining the corridor as an asset for future generations. Watch for further updates to come as leadership throughout the region work together to establish this unprecedented recreational greenway trail for the Shuswap. For an overview of the Rail-Trail vision, including the link with the Central and South Okanagan Rail-Trail initiatives, check out the presentation posted at www.shuswaptrails.com. Also - be sure to send support to the Okanagan Rail-Trail Initiative working on the Rail-Trail between Vernon and Kelowna. We're all working together to see these two new sections of Rail-Trail link up with similar trail efforts in the South Okanagan (Trails to the Okanagan and the KVR Rail Trail). Imagine: riding a bicycle from Sicamous to Osoyoos...not so crazy an idea anymore! 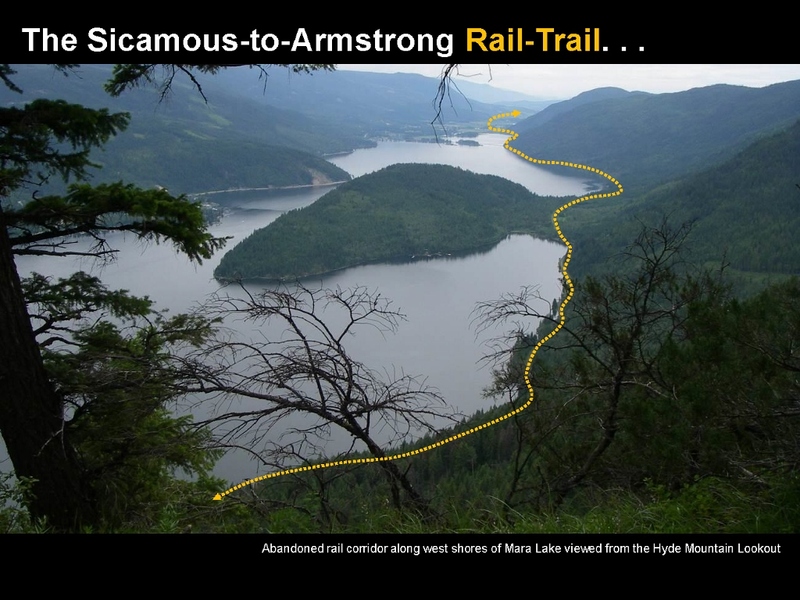 Photo: The Rail-Trial route along the spectacular west side of Mara Lake from high above on the Hyde Mountain Lookout. For an overview of the Rail-Trail vision, including the link with the Central and South Okanagan Rail-Trail initiatives, check out the presentation here.